Sony has released a few different models in its entertainment E-Series and the VAIO VPCEE3E0E/WI is the most affordable entry we've seen. However, although you get the same trusted Sony quality at a lower price, this model also has some limitations. For instance, the AMD Athlon II processor is underpowered compared to every laptop in comparison to the similar priced the Advent Eclipse E300. We managed some light multi-tasking, working on a few office applications at the same time, but the likes of the Lenovo IdeaPad Z560 produced a much smoother level of performance. As well as the basic processor, Sony has included an integrated ATi graphics card to keep costs low. While multimedia performance can't match the Lenovo, it beats most of the others. Only older games will run smoothly, but photo and video editing are both possible. 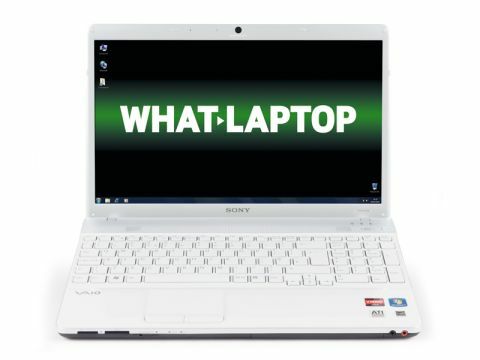 Sony's usual high build quality is evident, with a solid white plastic chassis that stands out from other laptops. A metallic finish to the lid gives a premium feel, while the unique sparkly design to the palmrest is thankfully very subtle and barely noticeable in certain light. The isolation-style keyboard is one of the best, with well-spaced keys that are a comfortable size, despite the inclusion of a numeric keypad to the right of the board. Only the directional keys are a little cramped. The touchpad is just as usable and clearly defined and textured, so your fingers don't stray. Portability is less impressive, however, with only 157 minutes of battery life available when away from mains power. This is less than we expect of modern laptops and only marginally better than the Advent, which lasted 152 minutes. A weight of 2.6kg means you can take to the road when needed, however. The display is not as bright as the Lenovo or Samsung R530-JA02UK, but with a resolution that matches the other 15.6-inch laptops, images look just as crisp. The glossy Super- TFT coating enhances colours, but makes this screen highly reflective and near-impossible to comfortably use outdoors. The 320GB of storage space is average, but networking is strong with 802.11n Wi-Fi and Gigabit Ethernet providing speedy connectivity. Four USB ports can be used to connect peripherals, although three of them are positioned very close together on the right edge. An HDMI port is also available, and separate SD Card and Memory Stick Pro Duo card readers allow direct access to portable storage. The VAIO VPCEE3E0E/WI is a mixed bag. Great build quality and usability can't disguise the slightly limited performance, while portability is hampered by the poor two and a half hour battery life.